The favorite cocktail for fall and winter, the old-fashioned lends itself to many varieties. Here are 12 that bartenders in Seattle and Bellevue are serving. By mid-November, we cast aside the Moscow Mule for the Old Fashioned. It’s our cocktail for fall and winter. A sipper, not a thirst quencher, the old-fashioned is boozy. It packs heat — perfect for this dreary weather. It consists of booze (usually bourbon or rye), sugar, bitters and water. It’s a tried-and-true template. Swap out whiskey for an aged rum; it’s winter in Martinique. Use a sweet spirit with chocolate bitters and zest: it’s dessert in a glass. 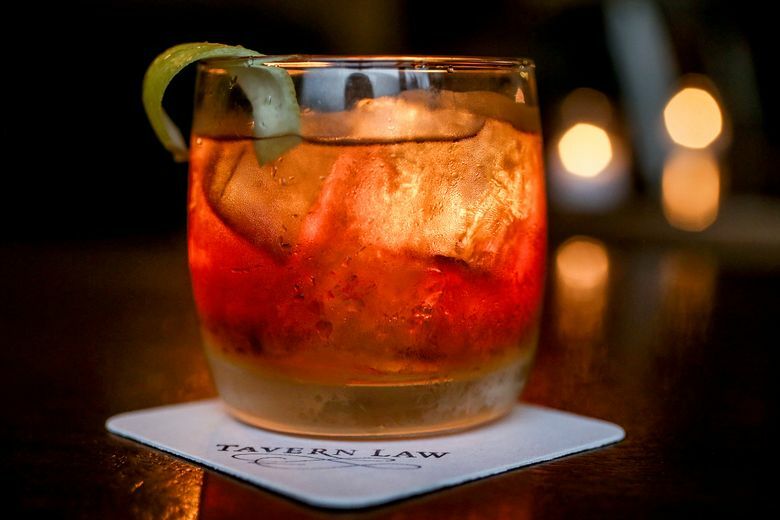 Talented barman Dustin Haarstad wanted to make this Capitol Hill bar more Japanese-whiskey focused, but I never imagined that would include a Waygu beef Old Fashioned. It’s as if a Bloody Mary and pho had a love child. 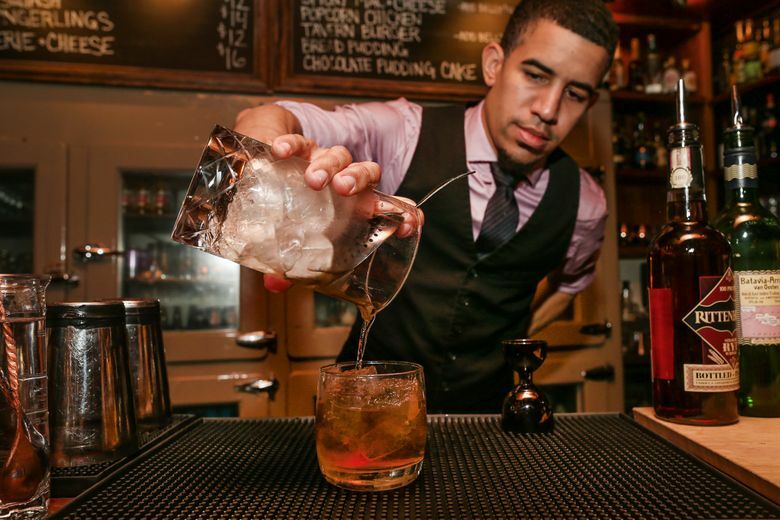 The drink is an homage to the famous bacon-fat and maple syrup Old Fashioned at New York’s PDT bar. Beef has been infused into the whiskey, the malt smoothing out the beef flavor to create a subtle, savory sipper. Jay Kuehner is the most creative bartender in the region. He does a South American take on this American classic, reducing chicha morada, a purple-corn punch, into a sweet syrup to pair with pisco, a brandy. Two dashes of Peruvian Amargo Chuncho bitters are added to accentuate the cinnamon notes. There’s none of the oak you usually get from an Old Fashioned. It’s a well-thought-out drink, beautifully structured, soft floral notes with the richness of an eau de vie. His Calma Chicha Old Fashioned is garnished with frozen purple grapes, a cinnamon stick and an orange peel. After bourbon and rye, aged rum arguably makes the best Old Fashioned. The spices from that spirit scream fall. Rumba’s new bar manager, Tommy Stearns, formerly of Canon and Foreign National, offers a variation that may become its signature winter drink. A boozy bonanza, it’s made with 13 different rums, some from pre-batched house blends. This blend of five different rums and muscovado syrup (anise, cinnamon, tonka bean, cardamom and mace) summons the tropics, but then this drink island-hops to Scotland with a half ounce of Caol Ila 12-year-old Single Malt, giving “The Drifter’s Old Fashioned” a savory tinge. Chocolate mole bitters and lemon go nicely with the peaty scotch to create one of the more sophisticated variations in Seattle. On paper, this drink — rye and Batavia Arrack — shouldn’t work. The funky, rice-based Batavia Arrack is challenging to mix with. But bartender Derek Jeffries pulls it off. 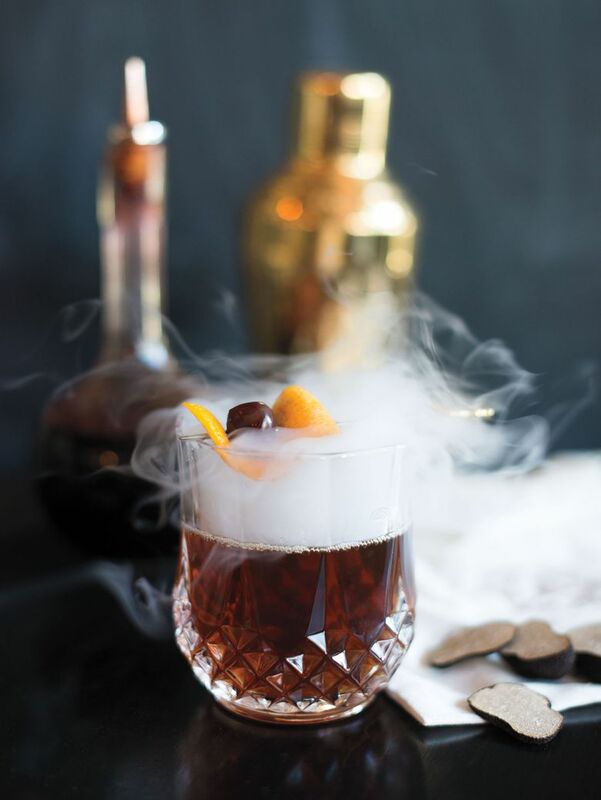 He uses a big, spicy rye to complement the molasses in the Batavia Arrack and adds chocolate and aromatic bitters to create his “Voodoo Child” Old Fashioned. Bourbon is mixed with allspice dram, a liqueur that tastes like the spices from an apple pie. I love the subtle backdrop of cacao and ginseng-like root notes from the Saler French liqueur and the chocolate bitters in this festive “Forager” cocktail. This is what a Fireball cinnamon-whiskey shot would taste like if it dressed up as an Old Fashioned. Spicy and zesty, Cursed Oak’s variation marries the peppery Rittenhouse Rye with a fiery habanero shrub. The brown sugar and orange zest make it go down easy. Let the drink mellow out for a few minutes if you can’t handle the heat. Bartenders often fly to distilleries in Kentucky to pick their own barrels so that their bars can offer distinctive whiskeys different from competitors. It’s often served in the bar’s signature Old Fashioned. At Lot No. 3 in Bellevue, the Knob Creek single barrel No. 3438 is served with a silky, spiced vanilla gomme syrup to accentuate the oak and caramel of that sweet whiskey. This acclaimed Belltown bar features a Christmas-themed drink every day during its Advent cocktail calendar in December. One of its most popular is the Walnut Old Fashioned. Lots of Christmassy components: Calvados, walnut liqueur and Angostura Bitters. It’s a nice change-up from the usual eggnog and candy-cane concoctions that pop up during the holidays. The bar’s “The Usual” is a rye Old Fashioned with the usual caramel and orange notes. The twist here is the rooty and licorice flavors that come from Amaro Nardini and some autumn notes from cardamom bitters. The Truffle Old Fashioned is destined to be a Seattle winter classic, a decadent drink that appears a few weeks before Christmas at Canon. In lesser hand, truffles would be suffocating in a cocktail, but barman Jamie Boudreau is an old hand at this game. He infuses black truffles with cognac, and he structures the drink with subtle vanilla, cacao and coffee notes (from tonka-bean syrup and Boker’s bitters).